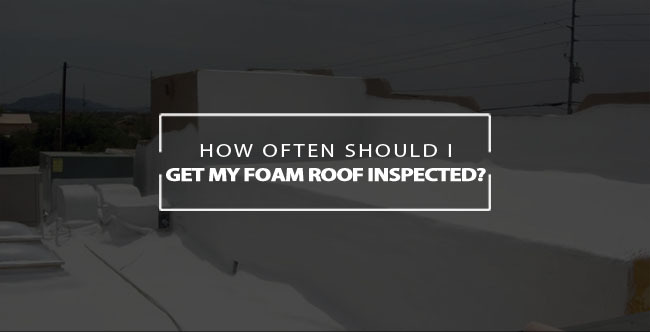 How Often Should I Get My Foam Roof Inspected? If you have foam roofing, then you are aware that it is extremely energy efficient and reliable in the best possible way. With effective insulation technology, it keeps your home warm in the winter and cool in the summer. It is probably the most useful roofing types, especially in the southwest region. But what about maintenance? Is there a standard period in which your roof should be inspected? What about repairs and damage? How long should your foam roof last? Luckily, there are answers to all of these questions. With the right kind of maintenance and the proper foam roof installation technique in Phoenix, your foam roof should last anywhere from thirty-five to fifty years. But how often should you really have your roof inspected for damage and repairs? Luckily foam roofing is cost effective on all fronts. It is cheaper to repair and inspect than standard tile roofing or shingle roofing. Plus, the foam doesn’t usually rip away with high winds like we get in the monsoon season in Arizona. It is self adhered so there is nothing to worry about with nails and other unreliable fasteners with tile and shingle roofing. Foam is lightweight and durable, so it can be really tough against the strong weather conditions in your area. As in the southwest regions, monsoon season can be harsh on your roof, ripping away shingles and loosening granules, making the repairs for your roof costly and really bothersome to try and maintain. With foam roofing, you do not have to worry about any of this. The tough top coat of your foam roofing can resist all kinds of damage and be extraordinarily resilient against the forces of nature. Foam roof inspections should be fairly infrequent, but you should have them done at least twice per year. In the fall, the inspection needs to be done in order to find any damage to repair from the rest of the year in preparation for the winter. The next inspection should be done during the spring to find damage that was done during the winter. This will keep your foam roof in the best shape possible for the future and it will ultimately make it last as long as it is warranteed to last. When the inspection is being done, you should really stay organized and keep all of the information from your previous inspections. This will help the new inspector (or the same inspector) keep track of all the Phoenix foam roof repairs that have been made and all of the modifications that need to be done in the future. This is a good tip for any kind of roof inspection because you never know when something has been improperly installed or repaired. So you will want an extensive history on your roof not matter what kind of roof you have. In addition to inspecting the surface of the roof, the gutters and other drainage is checked as well. This will insure the best possible roofing evaluation so that you know what condition your roof is in. It will also help us to be able to repair it in the best possible way. Having the right water runoff system is essential to keeping your roof in good the best shape. So if your gutters or other drainage systems need to be repaired, knowing this can help fix it to the best of your roofing company’s ability, and hopefully at a low cost. Once the issue is found, the repairs are usually very easily made. The most common problem with Phoenix foam roofing is small punctures and cracks that appear on the surface when extreme weather conditions become especially harsh. These are inexpensive repairs that should not happen too often to your foam roof. When making these repairs, make sure to use a licensed professional foam roof contractor in Phoenix, because you are still dealing with the roof, and it can be dangerous at times, so do not cut corners, or you could end up paying the price. So when you are looking for a foam roofing service that can install and inspect your roof, come to 1st Class Foam Roofing and Coating. We have the best professionals in the valley and we can even give you a free consultation to see what is best for your home. Our top rated foam roofing services are hailed by Yelp, and the Better Business Bureau, so you know you will be getting your money’s worth from us. So don’t wait another minute. Contact 1st Class Foam Roofing and Coating today at (602)-722-0663.